Founded by Samina Lakhani, Mélange is the final approach for fashion and style enthusiasts in Pakistani capital Islamabad. 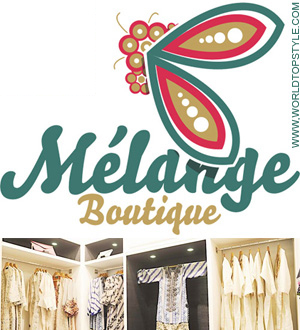 Melange presents diverse range of Pakistan's most sought after designer labels under one roof. 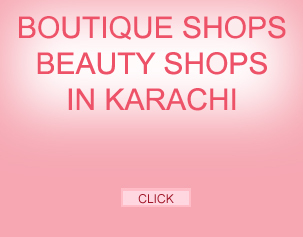 This luxury boutique maintains over 50 brands from Pakistan and abroad and designer outlet that offers a wide variety of women and men designer apparel along with accessories including clothes, bags, clutches, sandals, jewellery, luxury beddings, beauty products etc. Some of the designers under its umbrella include HSY, Shehla Chatoor, Rizwan Beyg, Sana Safinaz , Asifa & Nabeel, Ayesha Farook Hashwani, Elan, Deepak Perwani, Zara Shahjahan' COCO', Shirin Hassan, Sarah Salman, Sana Khan, Abida Nauman, Medley, Rabia Haris, Yasmeen, Guriya's, Ayesha Adnan, Balerina, HumaTaj, and EnRouge. China Market is above all a used second-hand goods market. Mostly furniture and house hold appliances bought off departing diplomats that purchased by clever people who resale the goods at sometimes very high prices. Buyer might strike a good bargain or come across an occasional gem well worth a visit but must go over bargaining enthusiastically as must to need it. Located at the most prestigious mall of Islamabad, the Centaurus Mall, La Societe is claims to be the Pakistan’s largest independent luxury retail group, specializing in contemporary Men’s and Women’s wear designer fashion, footwear and accessories. 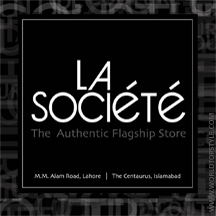 La Societe Pakistan in The Centaurus Mall Islamabad opened in June 2013 after decade long promotion with concept of high quality customer service alongside luxury designer products in the UK. The Societe has introduced leading designers of world to Pakistan and what makes it exceptional is that it only stocks current season merchandise. La Societe with a brand portfolio including Giorgio Armani, Hugo Boss, Canali, Dolce & Gabbana, Roberto Cavalli, Replay, William Hunt Saville Row today La Societe continues to strive for excellence and source key pieces and collections from the world’s most well-known iconic brands. The cool, spacious and stylish interiors of our stores allow each carefully selected brand to have their own identity and reflects the company’s philosophy of the importance of individualism and attention to detail. By providing impeccable customer service in a unique setting, La Societe strives to create a benchmark for luxury retailing. The La Societe website offers the same collection of iconic designer brands as at stores. Choose from a selection of leading international designers and the latest cutting edge brands to create your season style. With the latest designer fashion at your fingertips it has never been easier to perfect your style. The largest manufacturer and retailer of women’s fashion garments in Pakistan. Menswear, Cosmetics, Fragrances, Sunglasses, Handbags, Accessories, Children, Sportswear. Fashion destination Sydney. Menswear, Women's wear Designers' apparel. 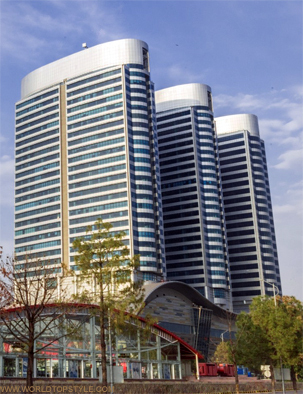 Islamabad tallest and most prestigious building The Centaurus mega mall is an iconic retail, entertainment, and lifestyle destination that catches visitors with its exciting and vivacious mix of retail and entertainment sections. Centaurus claims itself Pakistan's most successful destination for shopping and family entertainment. Regardless of this claim the combination of the stunning architecture, the size, quality of shopping, leisure, and convenience make it one of such destinations. All these qualities drive this mall to a commercial success and revolutionize modern shopping experience.